It’s hard to believe we have been in our house for almost one whole year! We actually went to settlement one day before Thanksgiving last year. Though we did not have a fancy setting at the time we did have the things that mattered the most and so, so much to be thankful for. 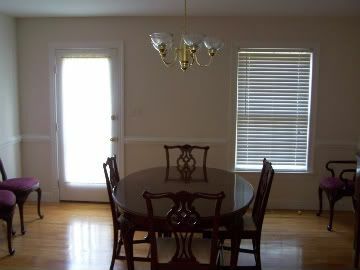 Here is picture of our dining room taken prior to moving in. The furniture was the previous owners and removed one we settled, leaving a nice empty room. Since the kitchen was a disaster without a working oven at the time, ‘hubby’ deep fried a turkey outdoors and my family pulled together and each brought a dish. I warmed dinner biscuits in a toaster oven and we sat on random chairs and some even on the floor to enjoy our meal. Last year really reminded me what it is I truly have to be thankful for. 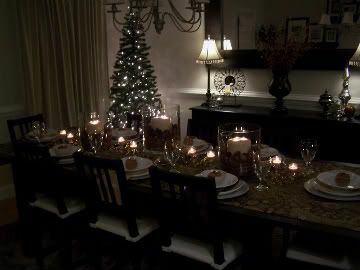 Even though I did not have my furnished dining room, decorated tabletop, candles lit and everything the way I wanted it, I realized that what we want is sometimes not always what we need. This year I am so grateful and ecstatic to have everyone return for yet another Thanksgiving Dinner. Even though our furniture is placed, the walls are painted, the table is set and things look a little different (and still not totally complete)- the reason we are all together has not changed. 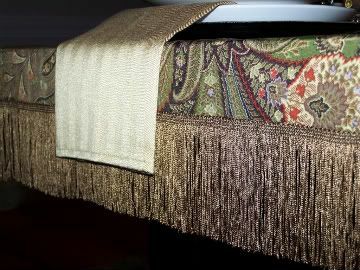 I always start my table decorating with picking fabric for a runner. I can never find standard made pieces that fit my table without buying multiples and worrying about fitting the seams together. It just makes sense to create my own plus I have a lot more options in fabric choices not to mention how cost effective it is! I found this amazing silk print and fell in love. I attached a fringe border to the edge for some glam. 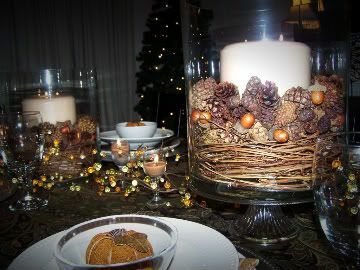 The centerpieces were inspired by Pottery Barn. 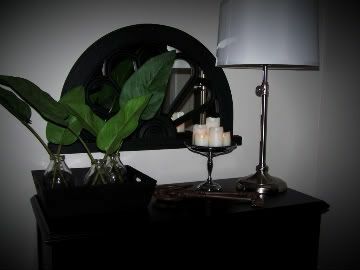 I love how they combine a little bit of fancy and simple nature elements together. 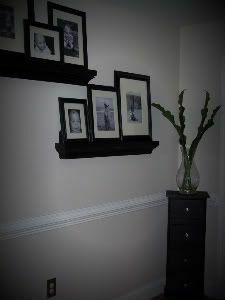 I adore all of their glass hurricanes and fillers – such great ideas for us to recreate at a fraction of the price tags! The bigger the better. I used three large glass hurricanes for the table this year. 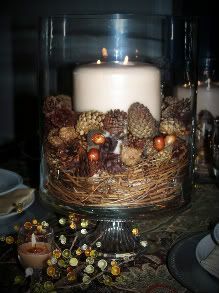 In the bottom of each I wrapped a section of twig grapevine and topped with pinecones and acorns completed with a three wick cream candle. I raised the center hurricane just a bit using a glass cake plate. 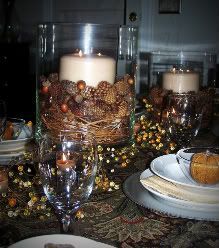 Glass bead garland was then inter-twined between the hurricanes along with some scattered mini candle cups. 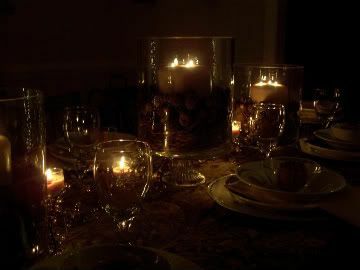 I love the ambiance of a candlelit dinner. 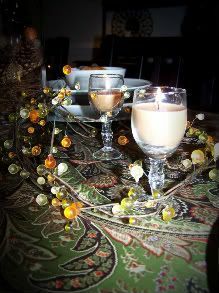 I use these mini candle cups a lot to scatter the candlelight along the table length. They are relatively low cost but create a huge impact. Did I say I ~love~ Candlelight! The settings are kept pretty simply with silver chargers topped with white dinnerware and mixed glass and porcelain bowls. I don’t really know how to set a formal table but I do try with what I have! Little pumpkins top each of the place settings to add a touch of orange. I still have to add the silverware and place cards…which are another project! 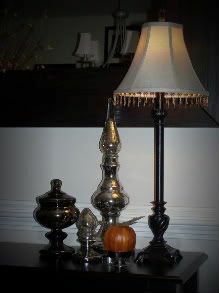 I like to keep most of my other fall decor items simple after Halloween; basically the center arrangement on the sideboard and a few pumpkins…and that’s it for in here. Oh, and if you are wondering…yes, that is a Christmas tree in the corner and no I do not keep it up year round. With the exception of last year, I always try to have our trees up for Thanksgiving Day. I don’t decorate them until after but still like to have them up with the lights on ready to go. It gives us plenty of time to actually enjoy them plus the Christmas feeling makes me all dreamy. We have a few trees around the house, but the ‘Dining Room’ tree is MY tree. I get to decorate it with all fancy, girly stuff! I’m a little hooked on finials right now. The mercury glass ones are an added plus. I can not get enough of them! I am still looking for just the right piece to complete this wall ~ Just can not find anything right now. I really want a mini bar so something of the sort. The greens arrangement in the corner just keeps getting moved around. It doesn’t really work with fall but the corner seemed too bare without it! Beautiful table! Your so right about being grateful for the little things. I love the runner and fringe. It looks like it covers the whole top of the table with the fringe hanging over the sides? I usually think of a runner as a narrow piece of fabric down the center of the table. I like this idea so much better. Having family around us, at Thanksgiving, is the very best. Whether we have the very finest or paper plates…a well appointed table, or buffet style, in the kitchen, having our family with us and being thankful for our blessings was what counted. We’ve had all sorts of Thanksgiving celebrations throughout out our lives. We’ll have another one the Sunday before Thanksgiving. Not the traditional date, but with a blended family we’ve learned, sharing the date, is part of the blessing. 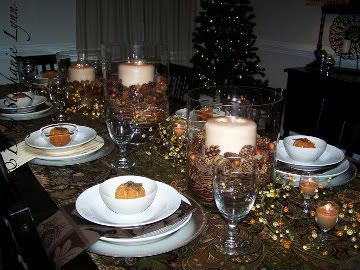 Happy Thankgiving Stephanie…your table is gorgeous. By the way, our niece is Stephanie Lynn, too! I LOVE the runner you created! So glamorous! And the centerpieces are brilliant. What a beautiful job on this tablescape. I also adore the warm glow of candlelight. It makes everything look that much more elegant. Beautiful! Your table is stunning! I love the pinecones, etc. in the candles. 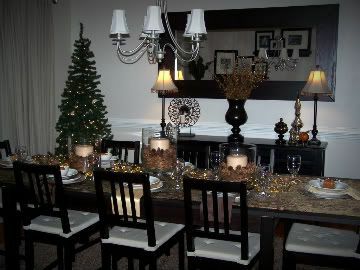 I will have my Christmas trees up in the dining room for Thanksgiving, too. Absolutely stunning table. Love the silk runner that you made. It is a beautiful print that represents fall but not in a cliched’ way, very elegant! You did a great job in the glass hurricanes. I can’t wait to see more. Stunning! Everything about your table is beautiful. Absolutely gorgeous! I love the tablerunner. The colours are soft, yet rich. Very elegant! I love your table set up!! I’m settling on my house the day before Thanksgiving. And while I’ couldn’t be happier to become a homeowner I’m so overwhelmed with the Thanksgiving holiday happening at the same time!!! 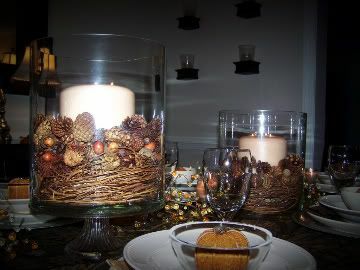 I love those hurricanes – the candles make such a big statement! Looks beautiful. Love those hurricanes with the natural elements and that beaded glass garland is so pretty! Such a beautiful setting. 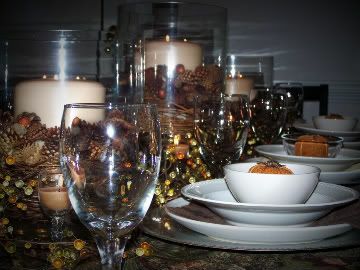 All the natural elements are perfect for a fall table. I like the idea of raising the hurricanes on the glass cake stand. I need to remember this idea. Very pretty room and table. Looks like you are ready for another Thanksgiving meal.Thanks for sharing! I so love your centerpieces! Oh, I wish I could copy it…but grapevines are no where to be found! Nice job! Could you like move into my house and redo it all, seriously! ?